It was on the night of December 10, 1986 when emergency services received the call. The voice on the phone, who identified himself as the son of actress Susan Cabot, breathlessly reported that a burglar had entered his mother's Encino, California home. Within minutes, a team of paramedics arrived at the hilltop home that the 49-year-old actress shared with her 23-year old son, Timothy Scott Roman. While her film career had ended years before, Cabot's colourful life, including several marriages and a one-time romantic relationship with Jordan's King Hussein, allowed her to own a magnificent house in one of Encino's most expensive neighbourhoods, complete with a magnificent view of greater Los Angeles. Though somewhat dilapidated compared to the other expensive homes nearby, she and her son managed to live there quietly enough with only the occasional media interview to disturb their privacy. On entering the house, the paramedics found a scene of utter chaos. Not only did the once-palatial home appear to have been ransacked, but it looked like a hoarder's paradise with trash bags, newspapers, and rotting food scattered everywhere. Furniture had been overturned and contents of drawers had been haphazardly spilled everywhere they looked. To top it off, Timothy Roman's four pet dogs were frantically barking and, to protect the paramedics from being attacked, needed to be retrieved and locked into a smaller room by their master. Despite his purported concern for his mother, not to mention his own claim to have been attacked by the intruder, Timothy seemed strangely calm as he led the paramedics to his mother's upstairs bedroom. But even the experienced paramedics weren't prepared for the sight that waited for them there. Susan Cabot's dead body, dressed only in a nightgown, was lying on the bed and it was evident enough that she had been bludgeoned to death. Bloodstains could be found on all the walls in the room and her face was virtually unrecognizable. Oddly enough, the killer had apparently covered her with a blanket before beating her to death though the fragments of her shattered skull, along with brain matter smeared on the bed, provided ample evidence of the violence with which she had been assaulted. Police were quickly called and, while they searched the entire house, no trace of forced entry was found anywhere. As for Timothy, he claimed that he had been awakened at 9:30 in the evening after hearing the attack in his mother's bedroom. On searching the house, he found the burglar, whom he described as a tall, Latino man wearing "Ninja robes." Despite his supposed martial arts prowess, Roman had been quickly overcome by the burglar who managed to knock him unconscious. He also insisted that the burglar had stolen $70,000 in cash which had been concealed in the house. Almost from the beginning, police had difficulty believing this story. Not only did Timothy's story tend to change details with each retelling, but the paramedics who examined him found no trace of any real injuries aside from some superficial lacerations. They certainly didn't find any evidence of a head injury severe enough to leave him unconscious. It likely didn't help that his physical appearance was distinctly odd, a legacy of the experimental hormone treatment he had undergone as a child to correct his physical dwarfism. Despite being twenty-two years old, he still resembled a teenager in many ways, albeit with a strangely wizened face. It was likely his self-consciousness concerning his height and appearance that led him to become a martial arts enthusiast, complete with weightlifting equipment scattered throughout the house and a framed picture of Bruce Lee in his bedroom. Timothy was brought down to the West Valley police station where he grilled for hours. Along with questions about the murder, police also tried to learn more about the relationship he had with his mother. which he described as "very close." Finally, after hours of questioning, Timothy Scott Roman was formally charged with his mother's murder. Taking the news of his arrest in stride, he asked to be taken back to the house to collect his medication and personal effects, While there, he then led police to the room where the dogs had been kept (they had finally been removed by Animal Control) and there, hidden in a laundry hamper, was the murder weapon: one of the many barbells he used for weightlifting, still covered in his mother's blood as well his fingerprints. Though he still denied killing his mother (at first), he insisted he had only hidden the barbell because he didn't think anyone would believe his story. Even as the forensic evidence against him was steadily piling up, media stories about Susan Cabot and her son were carried across the country. Most of them centered on the actress herself, including her film career during the 1950s that allowed her to star against luminaries such as Humphrey Bogart and Lee Marvin. After her film career in Hollywood, she managed to get a few Broadway parts before growing too old for the usual temptress roles that had made her famous. 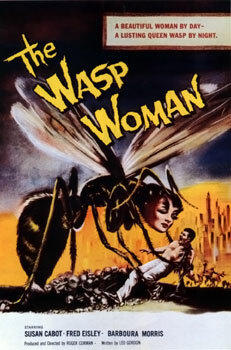 By the end of the 1950s, she was relegated to appearing in Roger Corman movies, culminating in her final starring role in the 1959 horror film, The Wasp Woman. She quit acting soon afterward. As for her son, e was even more of a mystery. Aside from being Susan Cabot's only child, little was really known about him aside from the medical treatment he had received as a child. Even the identity of his father was never really confirmed by Cabot (virtually every man she had ever been with was named as the possible father at some point, including King Hussein). According to some of the very rare visitors to their home on Charmian Lane, Timothy and Susan had a strange relationship with frequent arguments and a shared hoarder mentality that caused them to accumulate a breathtaking amount of junk in their otherwise expensive home. After learning about the acrimonious relationship that Cabot and her son had, police wasted no time in breaking down his claims of innocence and finally getting him to confess to his mother's murder. But their problems hardly ended there. By the time his case came to trial in May, 1989, his defense attorney, Chester Leo Smith, had changed his plea to guilty by reason of insanity. In making this claim, Smith insisted that Timothy's mental derangement had been caused by the hormonal treatment he had received as a child. Timothy's hormonal treatments had begun in 1958 while he was part of an experimental program run by the National Institute of Health. As one of the 700 children being treated for dwarfism, Timothy was injected with pituitary gland extract exracted from thousands of human cadavers. Over the eight years in which he received the treatments, Timothy showed no medical problems though he only attained a modest height increase and an oddly wizened appearance. Unfortunately, many of the other participants in the study wouldn't be quite so lucky. While Creutzfeld-Jacob disease (CJD) was relatively unknown at the time, a disproportionately high number of cases would be diagnosed in the years that followed the end of the study. More commonly known as "Mad Cow disease" these days, CJD is a rare and incurable disease often identified by mental deterioration, behavioural changes, and eventually, fatal dementia. While there was no evidence that Timothy had developed CJD, the lack of an accepted diagnostic test, not to mention reports of bizarre behaviour in other test subjects, was enough for his lawyer. As part of Timothy's insanity plea, Smith stressed that the incubation period for CJD could be more than twenty years in many cases and that he could well have developed symptoms without anyone realizing it. Referring to his client as a "human experiment gone wrong", Smith went to extreme lengths to paint him as nothing more than a victim of his mother's attempt to make her son look normal. Which went well with his attempts to prove diminished responsibility by portraying Susan Cabot as a disturbed Hollywood has-been incapable of accepting that she had lost her looks. It was also revealed that Cabot had helped herself to Timothy's medication in the mistaken belief that it would help her keep her youthful appearance (not unlike the character she played in her final movie, The Wasp Woman). By representing the dead woman as a bizarre shut-in who had managed to drive her son insane, Smith hoped to bolster his defense and win a shortened sentence for their clients. And the reporters covering the trial ate it up. Even Cabot's past relationship with King Hussein came under scrutiny. Though Timothy's real father was still a mystery, Smith presented evidence that Susan Cabot “received a regular sum of $1,500 a month from the Keeper of the King’s Purse, Amman, Jordan. There is written indication in the handwriting of Susan Roman that this money is from a trust. … For better or worse, it looks like child support," he added (the Jordanian government wisely stayed out of the whole matter). What was being conveniently overlooked was that many of the people who actually knew Cabot were scandalized by how she was being portrayed. Still, it was hardly a secret that Susan Cabot had been under a psychologist's care during the final months of her life and that she suffered from severe depression. Despite her frequent quarrels with her son, she also describe him as her only reason for living. It was also no secret that she had been slowly deteriorating in her final months and the images showing bizarre state of her house were used to demonstrate just how ill she had become. For whatever reason, Timothy became confident enough about the case his lawyers had built up to change his plea to not guilty. Shortly afterward, he took the stand for the first time in his own trial and insisted that it was his mother who had attacked him with the barbell forcing him to beat her to death in self-defense. Though this directly contradicted the confession he had already made, his testimony was allowed to stand. On October 10, 1989, Timothy was found guilty of involuntary manslaughter and, having already served two and a half years in jail awaiting trial, he received only three years probation. In handing down her decision, Judge Darlene Schempp stressed her belief that Timothy "loved his mother very much" and that there was no malice or premeditation in his actions. He largely vanished into obscurity afterward though some sources hint that he later developed a brain disease (possibly CJD) which led to his death in 2003. While his mother had been buried in Hillside Memorial Park Cemetery in Culver City, Timothy's ashes were reportedly scattered at sea. As for the fatal house where the murder had taken place, it has long since been demolished and a new, more lavish house stands on the spot. All physical evidence of that long-ago murder and what really happened has been obliterated. But a bizarre postscript emerged in 2018 when declassified documents were published showing that the Central Intelligence Agency had deliberately set then-Prince Hussein up with Susan Cabot to ensure Jordan's continuing cooperation with United States interests. If Timothy really was Hussein's son, it remained a secret on all sides. Hussein died in 1999 and his official biography makes no mention or either Susan Cabot or the son they supposedly had together.